My Sewing Room is Finished! Oh boy, do I have something to show to you today. When my husband and I were newlyweds, I didn’t have many craft or sewing supplies. What I did have fit in a box, and that was stuffed in a closet somewhere. Sometime after we bought our first house, I progressed to a stack of boxes in the corner of our room. I couldn’t fit them in the closet anymore. Eventually we built an addition on to that house, and what had been our son’s bedroom was open to use as my sewing room. I moved in, and proceeded to fill up all of the available space. I could just walk in and work on a project and leave at will! When we moved into the house where we are now, I claimed a room in the basement. The spiders were there first, and it was pretty cold in the winter, but it was mine and even bigger than the room I had before. I didn’t like that I couldn’t see what was going on upstairs or outside, but I couldn’t go back to not having a sewing room. When my son got a little older, he expressed an interest in moving down to the basement. I jumped on that. We spruced up the room and he’s slept there happily ever since. The room he vacated is right next to our office and has a window facing the front of the house, so I was thrilled to move. The funny thing was, the mismatched, messy stacks of storage containers and furniture that seemed at home in the basement looked like some sort of deranged nest when we moved them upstairs. How did I ever find anything in there? This was around the time I started this blog and my Etsy shop, so I did have to stay somewhat organized in at least one place, just so I didn’t lose track of any inventory or orders. I know, finding the organized spot in this photo has a little Where’s Waldo feel to it, so I’ll just tell you – it’s those four blue boxes. I was also sharing space with two large pieces of exercise equipment. My nerves were frayed. I felt like my husband was going to come home one day and find me buried in an avalanche of fabric, glitter and hot glue. Since this was no longer just a hobby for me, but I was doing actual work, we decided to start turning into something a little safer for my mental health and more functional for my job. We couldn’t tackle the whole room at once because as much as I’d like to say otherwise, Ikea did not sponsor it. We decided to start with one side, moving around the rest of the room later. We replaced that scary mess in the first pic with this. The change this made in the functionality of the room was amazing. I could actually find things when I wanted to. I was still setting up an extra table when my shop got busy for the holidays, and that exercise equipment took up more than its fair share, but it was definitely a huge improvement. I just needed to be patient until we could finish. And then my daughter got engaged. Any of you who followed along last year will understand when I say that event enveloped our lives and living space. One piece of workout equipment was moved to the basement, and the other was buried, along with a large portion of this room, with wedding stuff. With the engagement lasting over a year and the wedding being held at our home, it couldn’t be any other way. The rest of the room was put on hold, and we very happily dove into planning. After the wedding was over, I not only had my sewing room back, but with our daughter moving out, we had another bedroom with no purpose. We decided to turn it into a guest room/workout room, so I was free from those big machines taking up my creative space. However, it still had a messy, piled up feel to it that I wasn’t enjoying, and my side-by-side but uneven banquet table workspace could have been more functional. Spring came, and it was time to finish that room. My ever-patient husband spent so much time with me at Ikea and at home assembling furniture that I can’t believe he didn’t just run away screaming in Swedish. My son’s eye still twitches when you mention that dark time. The walls were still brown (the color my son chose for his bedroom) so we lightened up three walls with an off-white called Bunny Cake. Who names these paint colors? Anyway, we had started with dark cabinets years before, so we had to stick with them, but the wall color helped make that work. I picked out linoleum for the counter that looked like cardboard (which I love), so that brought the brightness up a bit as well. I’m so happy in this room now. Let’s take a tour. When you walk in, to the left is the cabinetry we had already installed. I love being able to label all the boxes, and for everything to have a home. Moving to the right, where the cabinet used to end and the weight machine stood, we added another tall cabinet. Across the end of the room, we left a gap where my husband installed a short rod for hanging. It seems like I always have shirts or other garments waiting for projects, and with the addition of vendor aprons to my shop it’s nice to be able to hang those. The shelf across the top provides me with a spot for decorative things I just want to be able to look at, which just wasn’t an option before. Next to that is my favorite corner – fabric. I don’t know which I love more, the long countertop, all the drawers and shelves, or that pegboard on the wall at the back. I also have space above the shelves for more decorative stuff. The thought of actually decorating my sewing room was weird. 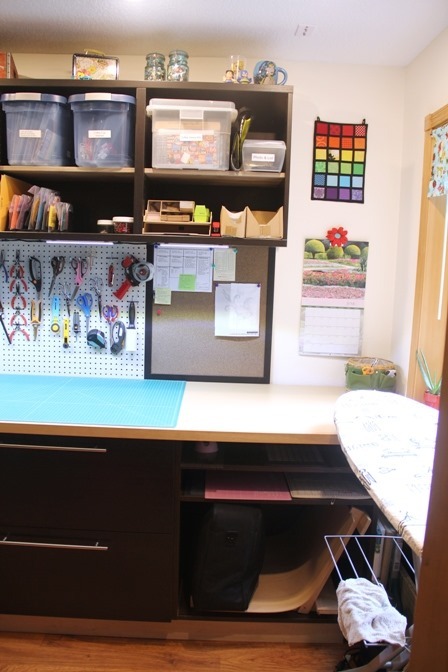 I have corkboards at each end of the counter space, and all that shelving provides me with plenty of room for my supplies, inventory and mailing needs for my shop. This was finished in May, but I actually bought a pretty new calendar, just so it wouldn’t mess up the new vibe I had going. By the way, you can get calendars for $1 in May. The room is rounded out by my ironing board under the window and next to the door. I can’t tell you how satisfying it was to put everything up on this pegboard. My husband walked in and said “I never realized how many scissors you have!” I didn’t have the heart to tell him about the ones still in a box. It’s made a huge difference in my workflow to have all my tags, precut notions and hardware in the jars under the edge of the counter. All I have to do is twist, pull out what I need and twist it back up. And I can’t emphasize this enough – LED under cabinet lighting. This isn’t a big room, but with it organized this effectively it’s more than enough room for me. 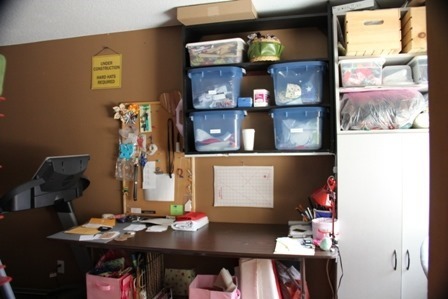 A quick search on Pinterest will show you lots and lots of very pretty sewing or craft rooms. Everything is color coordinated and there’s space to spare. They look like something out of a magazine. If you have a room like that, you have my admiration for being able to keep it that way and still use it. 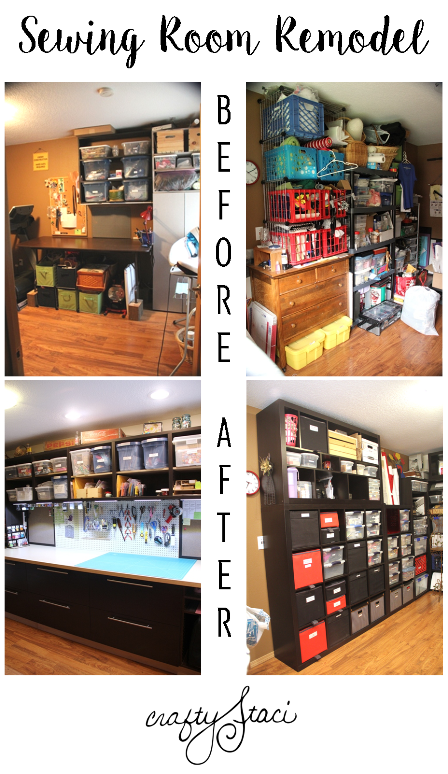 My newly finished sewing room is not one of those spaces. However, you won’t find a more functional, usable room and there’s so much of me in it. I feel relaxed and ready to work when I walk in, rather than anxious and stressed because of the mess, and that was definitely worth the wait.